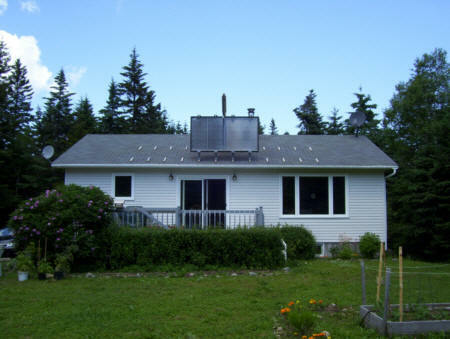 Nathan did a really nice job of building and documenting his solar water heating system. 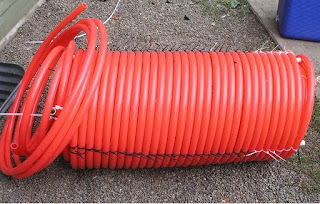 The system is an offshoot of the $1K solar water heating systems with some useful new design features. The twinwall glazing is a very nice look. more water exposure to each coil. 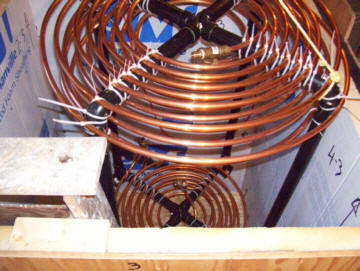 Be aware that this recoiling can be a challenge -- think about about your method if you don't want to end up imprisoned in a coil of angry PEX. 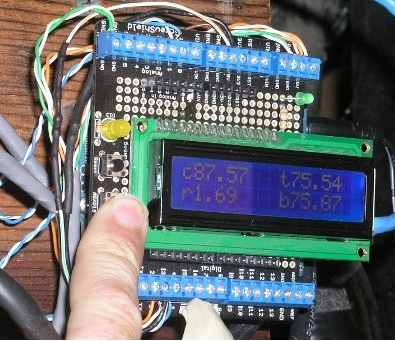 Nathan also offers details and source code for making an open source Arduino based differential controller. Nathan has the Arduino based controller equipped with an Ethernet shield. This allows the Ardduino to log data directly through his router to an free online logging service called pachube.com -- there is no need to have a PC running 24/7 for this kind of logging, and it gives you access to the data from anywhere -- very nice! Tom uses recycled bulk milk tanks from dairy farms for solar heat storage in some of his solar installations. Bulk milk tank reborn as solar heat storage tank. 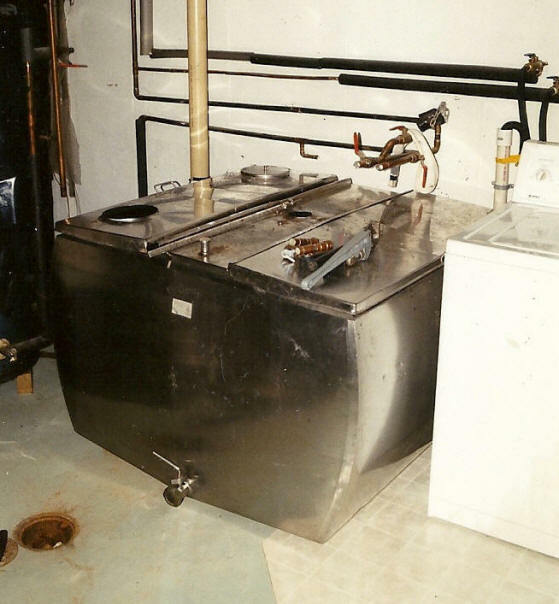 These tanks are made from stainless steel, and will provide a very long life. The tanks already include some insulation of some of the surfaces. The tanks are typically in the 300 to 500 gallon range, and the price of the used tanks is about $1 per gallon. Heat Exchangers mounted in bulk tank. Andrew designed and built this small solar greenhouse using mostly materials from the local Habitat Restore. Solar greenhouses use a variety of features such as double glazing, insulation for non-glazed exterior surfaces, added thermal mass, and passive ventilation systems to reduce or eliminate the need for backup heating and for powered ventilation. Andrew's design incorporates all of these, and he provides some summer and fall temperature and humidity logs to show how the greenhouse is doing. Inside view showing water barrel thermal mass. Performance plot for the greenhouse. In addition to performing well, Andrew's greenhouse looks great! Glazed with dual wall polycarbonate glazing. A unique collector frame that uses EPDM rubber roofing for weather protection. 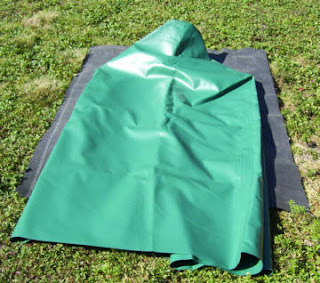 Using a custom made PVC tank liner instead of the usual folded EPDM liner. 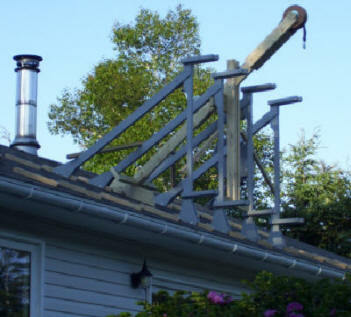 Lots of detail on roof mounting the collector, including the site made collector hoist shown just below. A unique design approach to handing differential expansion issues in the absorber design. 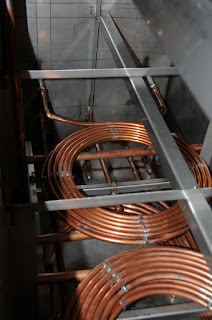 The collector loop and domestic hot water heat exchangers in the storage tank. This seems like a good way to go if you can get a competitive price on the liner. Custom made hoist to lift collector to roof. These collectors are heavy, and Bill has several of them to get up on the roof -- the hoist will save a lot of work and be safer.